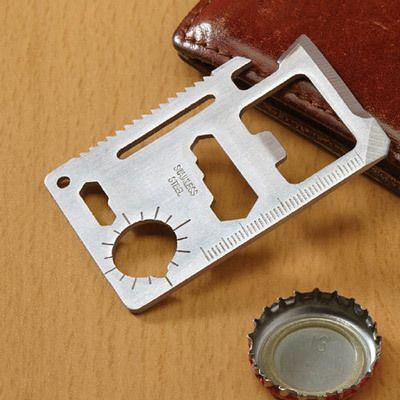 Amazingly small, stainless steel multi-tool is the size of a credit card! This Wallet Toolbox is great for travel, camping, fishing, gardening. Features a can opener, knife, screwdriver, ruler, bottle opener and much more. Protective case included. 3" x 2". This is a very nice gift as a stocking stuffer! I have no issue with the purchase, only that it took so long for my items to be delivered. Over a month to get them! I am looking forward to giving the wallet tool box to 12 family and friends. I think they will love them. I was pleasantly surprised. They appear to be of good quality. I would recommend this for a gift or for yourself.